This oatmeal cookie recipe is so good they are some of the best I have tasted. These cookies are very easy to make and a healthy cookie recipe to boot. See the tips and variations section below for delicious variations on this classic cookie. Cream together butter, sugars, egg, water and vanilla using electric mixer at medium speed. Mix until light and fluffy. Combine flour, soda and cinnamon. Add to creamed mixture, mixing on low speed until blended. Stir in oats and raisins. Drop dough by heaping tablespoons full onto greased baking sheets. Press them flat if you want a crisp cookie, or leave them rounded if you like a chewier cookie. Bake at 350° for 12-15 minutes only until edges of cookies are golden brown. Makes about 3 to 4 dozen cookies, depending on size. Substitute whole wheat flour for the all purpose flour to create an even healthier Quaker oats oatmeal cookie. Replace the raisins with chocolate chips for a decadent oatmeal chocolate chip cookie. Replace 1/2 the all purpose flour with oat flour to create a healthy oat flour oatmeal cookie recipe. Oatmeal cookies are a real favorite of kids and adults alike. They are my all time favorite and welcome any time in my home. Add 1/2 cup of nuts for extra taste and nutrition. 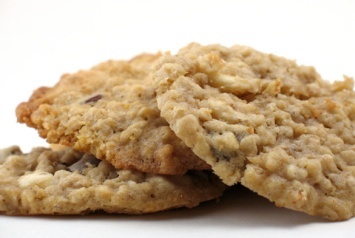 Look here for other quaker oats recipes as good as this oatmeal cookie recipe. 1/2 cup butter is enough, and skip the white sugar, use only the 3/4 cup brown sugar and reduce the overall amount of sugar and butter for a healthier cookie…Also add a sprinkle of cloves, ginger, a dash of salt for more flavour. I let the batch of raisins soak up an ounce of rum, not much over all that amount of food. Personally, I would say the chopped nuts fits better with chocolate-chip cookies, not oatmeal cookies. I would highly recommend 2 eggs, not just 1 egg to keep the cookies from crumbling. – I make the cookies big – so set timer to max time of 15 – then check them every 3 minutes (I still like them soft – but cooked through) – often cook time is about 19 minutes. – Very easy and simple to make – don’t pull out a big blender – just a hand blender does fine and cleanup is easier. – add 1 cup granola and take away 1 cup oats if you want a different taste (super yummy)!